We often read fictionalized accounts, or watch poignant movie portrayals, of someone stranded on a desert isle who drops a message in a bottle in the hopes of getting rescued. Why didn't they think of that on TV's Lost? They may have gotten off that bloody island by now. Or on Gilligan's Island. 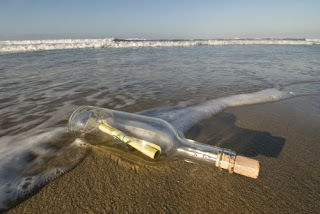 I don't think they ever thought of a simple message in a bottle in the three seasons they were on television. Three seasons? It was supposed to be a three hour tour...a three hour tour. Add on Gilligan's decades of syndication and that little sucker wasn't a clueless bumbling nincompoop for 3 hours or 3 years. He showed us how dumb he was for close to 30 years. It also perpetrated the age old question, "Ginger or Mary Ann?" I wonder if Sting was thinking of Ginger and Mary Ann when he wrote his Message in a Bottle in 1979. Formed in 1977, The Police were known for the reggae-influence in their music. This song is from their second album Regatta de Blanc, a top seller in Britain and the rest of Europe. The video is somewhat unique in that it is apparently the televised debut of Message In A Bottle, prior to its recorded release. It's also before the band members dyed their hair their trademark blond. Another message in a bottle, as it were. This musical interlude is brought to you by Theme Thursday. Drop by and follow the links to see how my blogging buddies interpreted "bottle" today. Gilligan was an oaf. Too much reefer. I want to know why Ginger brought all those evening dresses and jewels on a three hour tour, a three hour tour. The professor should have thought of it! Deb: The Captain had the drug problem...and ensuing munchies! Ginger's extensive wardrobe was never explained. Willow: He'd have been the logical one. California Girl: Yeah, me too. I thought the vid was an interesting find. My vote is for Mary Ann. UR: I confess I was always a Mary Ann fan. I'm a huge fan of Sting and The Police. Just not when they are trying to give me a ticket. Thank god you posted the Police video so I had something else besides the theme from Gilligan's Island to circle round in my head today. Quirks: Oh I hate to get stung by the police! Don: Mary Ann's in the lead. Great song. Yep, I like your idea of an ending to Lost. A small note in a bottle would work wonders. idifficult: I lost interest after season one. Considering that they were just a blip on the pop music radar (five albums over a period of just under five years), they were pretty damn awesome. "Roxanne" will always be a personal favorite. Chris: I saw them on their reunion tour...they were still pretty good. Enjoyed the show a lot. Always thought it was unrealistic in that there should have been children by season 3. Too hot for TV I guess, at least back then. Dreamhaven: The last thing that show needed was a bunch of little Gilligans running around the island! I dropped a bottle in the English Channel back in 1975. It had my address in it -- my cousin lives at that address now. Every day... I wait... hoping someone has found the bottle and sent a postcard to my old address. OK. That might be an exaggeration. But, wouldn't it be cool? Cdn Blend: It's been known to happen.